I am convinced he is going to come early for no reason other than I’ve been feeling so much more this time around. Many more Braxton Hicks, more twinges and pressure down there. Occasionally I will stand up or shift my weight in such a way that I feel like he’s going to fall out! Braxton Hicks have gotten more frequent and intense lately. I had one in the middle of the night that was so intense I couldn’t move! It wasn’t painful at all, but I just couldn’t really bend to get out of bed. It lasted a few minutes too. 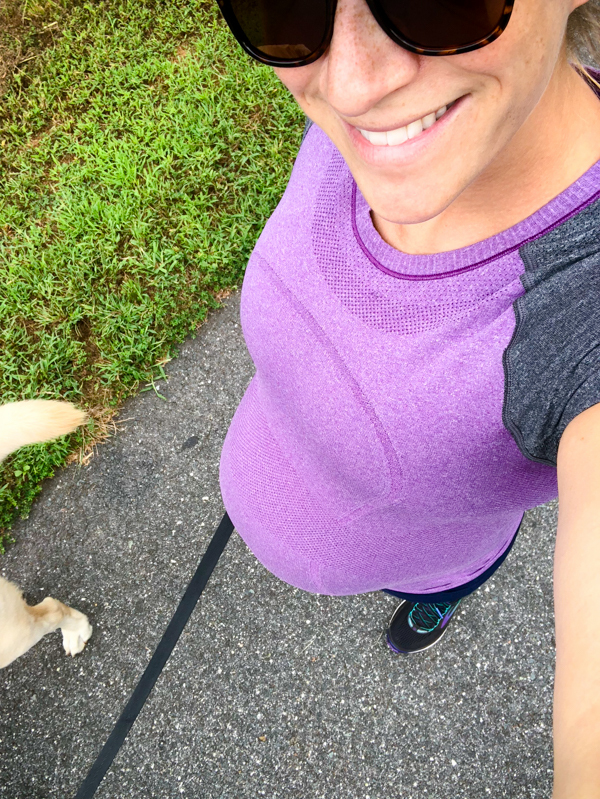 I generally get them whenever my uterus changes – getting up, sitting down, rolling over, waking up, going to the bathroom. This has to be a good sign my body is gearing up, right? Sleeping is going as best as can be expected. Rolling over is hard, and if I don’t move slowly I risk cramping and/or my pelvis popping in this scary-sounding-but-not painful way. The snoogle pillow has literally saved my life. I don’t think I used it to its full potential last time! The jersey pillowcase I got for it was a total game changer (it’s just so soft). 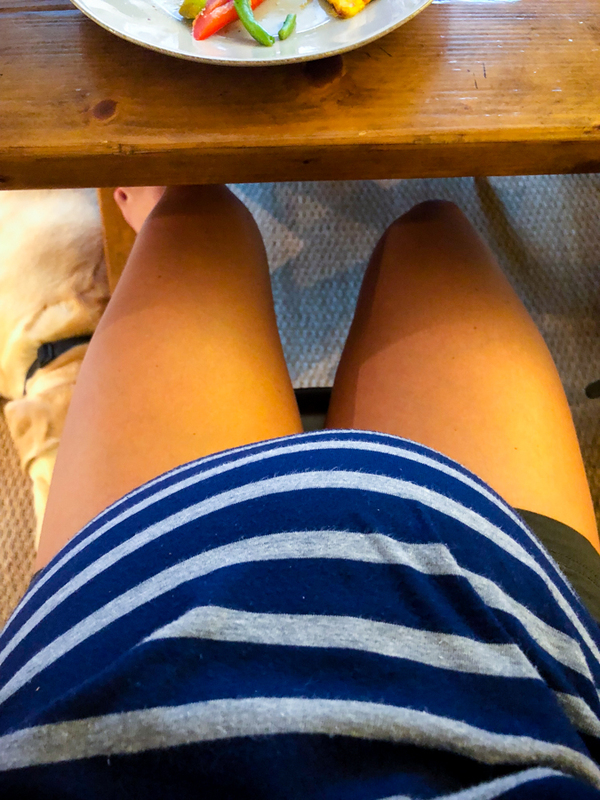 My glutes continue to throb in the mornings, but I tuck a lacrosse ball under there and lie on it for a few minutes and they seem to release a lot of the tension. Sometimes in the middle of the night, towards morning when I’m really starting to ache, I make a donut with the snoogle and lie ON it and the relief to my aching is INCREDIBLE. It’s hard for me to spend the whole night on my stomach donut, but when I do make the effort to do it, it’s heavenly. I can’t wait to sleep on my stomach again! I still laugh when I read my Mazen recaps because at 35 weeks last time sleep was the topic of the week too! I’m trying to stay as active as possible this time around. I think last time I was just going to strength class and walking. That’s pretty much what I’m doing now with cycle classes thrown in, but I’m definitely pushing myself more in class than I did last time. I’m trying to maintain my strength, especially knowing I’m going to be taking some time off. Still doing some jumping, cardio interval moves, and using 15 pound weights (I remember I was down to 10s last time.) I seriously don’t know how anyone could run this pregnant, much less run a marathon!! But I know people do it! I flip flop between feeling huge and immobile and feeling totally normal. It just depends on the day and the hour. 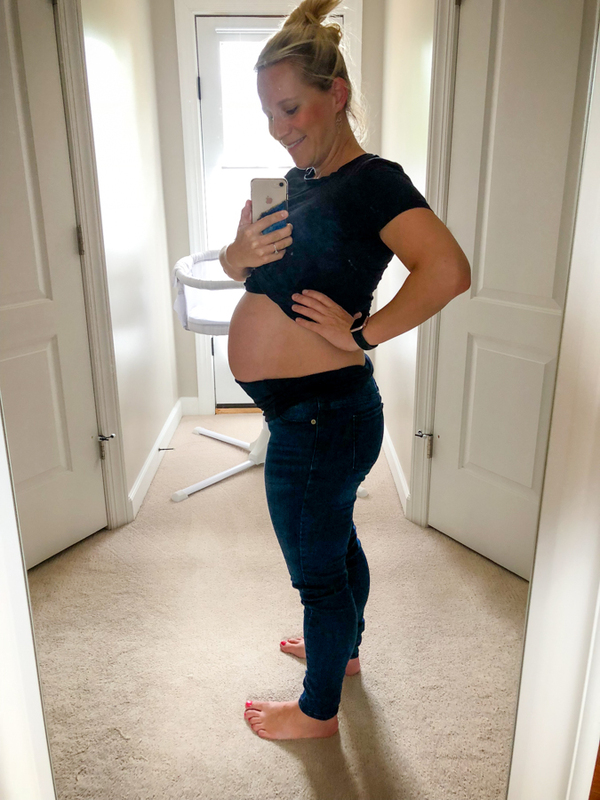 His movements have gotten to be so big and dramatic in there, and I’m starting to really feel how big he is – and getting nervous about him coming out!! I am actually most comfortable standing up, and all the lounging positions are the hardest. I try to sit with my legs criss-cross on the couch, and lying down is just not very comfortable at all. So it’s hard to relax! But it’s also hard to stand all day, so there’s just no comfortable position at this point. You know how you used to take off your pants when you were little? You’d push them down and then alternate stepping on each leg until they were inside out? This is the best way for me to take off pants these days because bending over and standing on one foot is just a wee bit too tricky. One new symptom I have is swollen and sore fingers. I’m only wearing my engagement ring because my wedding ring was feeling kind of tight, and my finger joints feel stiff! I don’t really look swollen, but I think I must be. Speaking of Mazen, he’s in total teaching mode with his brother already. We read books to him together, and we show brother how to take a bath, or how to put on an outfit, etc. It’s actually been a great way to get Mazen to do things he’s not into. Example: “Mazen! Let’s show brother how you take your dinner dish to the sink!” It makes me so excited to see all the cute things they will do to interact when he’s here. I said at dinner the other night “I think brother is going to have black curly hair like Thomas” and Mazen replied “No! He’s going to look just like ME!” We shall see, Mazen…! Everyone is different of course but, with my 2nd and 3rd babies, I had lots of tightening, twinges, pressure, etc from like 25 weeks on . . . and just like baby 1 (where I felt nothing other than baby movement until labor started) they were both like a week LATE. 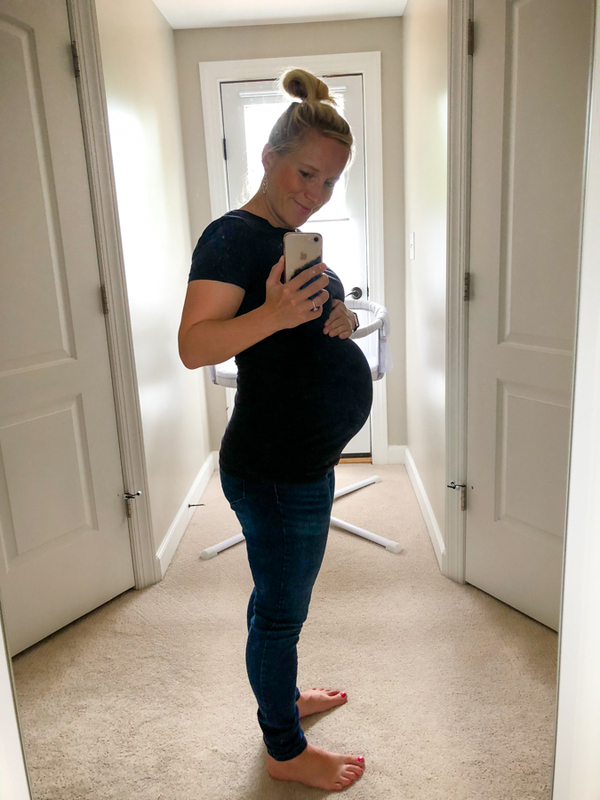 I think pressure and pre-contractions are pretty typical early on for babies after the first because everything is kinda stretched out and your body knows what to do. Probably why subsequent births are so much quicker too. 12 hours for baby 1, and less than 2 hours each for baby 2 and baby 3. Good luck! I think more likely their due dates were off but yes! 10 pounders and they just shot out like rockets! SO much easier than the first labor. I had Braxton Hicks only on one side too with my 2nd. It is SO WEIRD. Real deal contractions ended up only being on that same side as well. 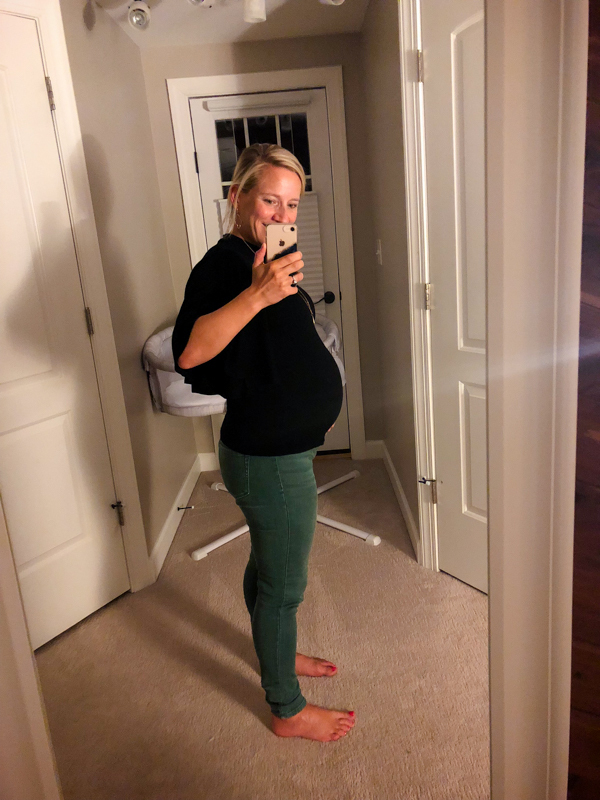 I had braxton hicks for 3 weeks- they were so bad that I was actually admitted to the hospital twice before my actual labor. Good luck! Man i didn’t know they could get so intense! Mine aren’t painful at all – just really awkward. Kath, I’m pretty sure I had a dream about the giant cake you posted yesterday! 🙂 too funny! You look great, glad you are feeling good too!! I love how you can compare to your 1st pregnancy. I’m amazed with how active you are! I hope you continue to find some comfy ways to get some good rest before the little one makes his arrival. HOME STRETCH!!!!! October is right around the corner!!! You look great!!!! Wishing you a restful final few weeks until the new addition comes! I love that Mazen is so excited about baby brother. I cannot wait to see who he resembles as well and what his name is going to be! So exciting. 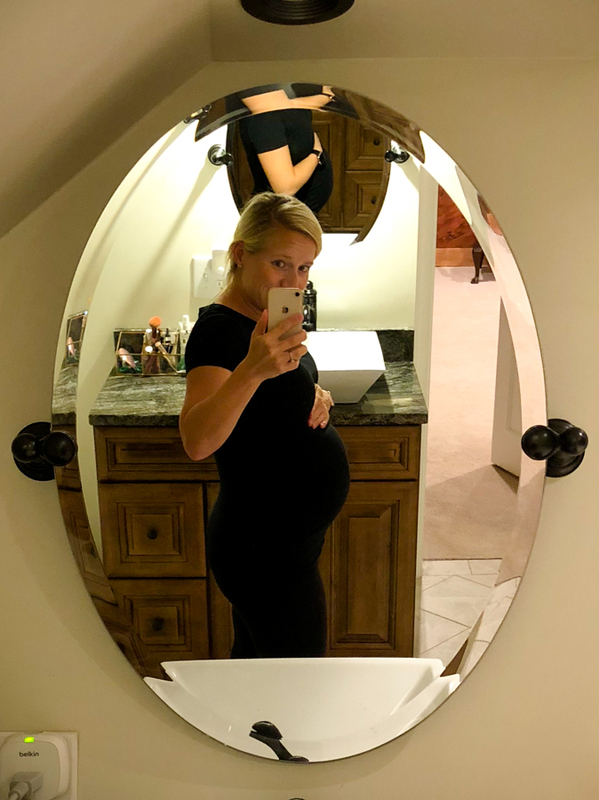 This phase of pregnancy is my favorite, baby is safe and close to me but all of the anticipation of what is coming is there … savor it momma! I was miserable with my second born in August and convinced he would come early. Nope, 5 days late and that’s with going to the hospital to be induced by having my water broken. I’m excited to see who he looks like, too! Take care, Kath! Time will fly by! Where are your pants from that you’re wearing in your recent 35 week photo?! Love them! Both the jeans and the green pants are these!